Buried HALFAYA SOLLUM WAR CEMETERY, Egypt. 19. C. 8. Aged 24. 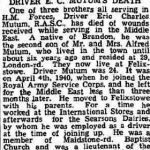 Son of Alfred and Alice Amelia Mutum, of Felixstowe, Suffolk. Eric was born in Brandon and his birth was registered during the first quarter of 1917. His parents were Alfred (born in Brandon)and Alice (nee Hogger, from Stowmarket). Eric was the second of three sons, the others were Cyril & Ernest. In 1928 he was awarded a scholarship to attend the West Suffolk County School, so he seems to have been an educated man, whcih is borne out in his religious studies. In May 1931, Eric, a scholar at the Baptist Sunday School, passed his scripture exam, and in March 1933 he was addressing the monthly meeting of the Senior Christian Endeavor, which indicates faith was a leading light in his life. At the time his family live at 29 London Road, Brandon. At around 1935 he and his family moved to Felixstowe, where he carried on with his Baptist duties and also became Lieutenant of the Church Company of the Boys Brigade (Felixstowe). Eric is also remembered on the Felixstowe war memorial.